I've been busy at work, coding like I've never coded before ^^;; Lots of cool updates, features and future projects to talk about today. First off, you will see some changes to the blog. I finally updated the rotating photos from what I had months ago. 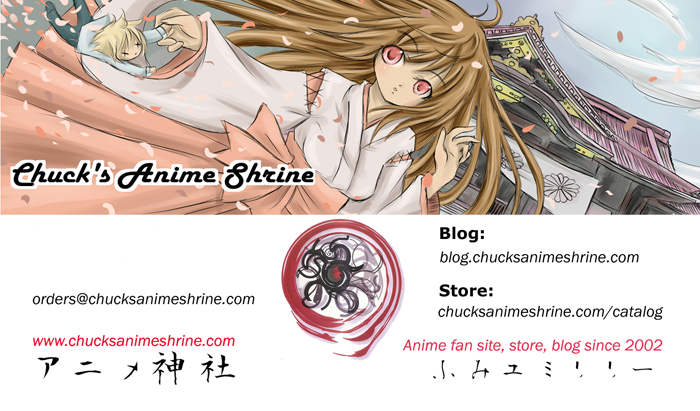 I also added some colored text to the main links, a popular posts widget, a faster loading anime store products feed (sadly having to drop the image thumbnails for now ^^;) and an "(M)" link up top to represent the Member's Blog so hopefully there's even more exposure for anyone willing to participate in the anime blogging. Though this site is called Chuck's Anime Shrine, it's for years had a second person behind the scenes, my fiancee Danielle. That pink link you see up top directs you to the new section on the site; kawaii.chucksanimeshrine.com. Her Sweet Kawaii blog is meant to be the more cute, feminine version of this blog. I tend to show anime girls and stuff us guys (or girls) might like but Danielle will for example have Fan Service Friday posts that show off the anime guys that make the fan girls nose bleed ^^;; She also talks about cute and funny anime series that we've been watching on sites like crunchyroll or in general. As that section grows, you will see more kawaii-based selections and even a store of Danielle's custom kawaii-styled items. Ah, back are the nights of coding and the inevitable debugging that happens since I've learned that there truly is no cut and paste, turn-key feature in computing. It usually involves you drinking some coffee (or energy drinks) and kissing your nights of sleep away. First off, some of you have noticed that I've set up a true 128 bit security to the site. Since I originally used the external Paypal module for paypal and direct credit card payments, all was safe anyways for everyone shopping in the anime store since Paypal ran the security of data. Sometimes an extra level of security is needed so I simply had to add the security. One kickback though is that you guys do have to make sure your browser's cookies are running; I know us anime fans are keen on being as anonymous as possible but don't worry, the cookies won't be omnomnom-ed by me. Speaking about being anonymous, I've removed the need to include your phone number when you sign up for an account in the store. We know more than others how email and social networks are a more convenient, less intrusive way of communication and if I don't show my phone number (unless asked for in correspondence with orders), why should you. I've also added Amazon Checkout to the store, so now if you don't like Paypal or just shop on Amazon more...you are covered ^_^ If you want to pay via a direct credit card...you still need to use Paypal's module though ^^;; chances are in time I might add an Authorize.net setup for those not wanting to even deal with Paypal in any way. There's also the Anime Sanctuaries that I started months ago, more AMVs and flash animations (yes after all these years), a section for the mascots Fumi, Yumi and Lily (and a mobile game?) and with me possibly becoming an anime and videogame voice actor... a section showcasing my voice demos and hopefully a list of the characters I'll be the voice of.